CAMPAIGNERS HAVE CALLED for a public meeting on the future of an iconic Dublin Georgian building, which they want to save from going into private ownership. The Hume Street building was placed on the market last month with a €3million price tag, six years after it was acquired by developer Michael Kelly for €30million. The Save Hume Street Campaign has prepared a detailed proposal to redevelop the site as a Diaspora Museum/Genealogy Centre alongside live/work space units for the creative sector. An alliance of conservationists, artists, architects and local politicians are working on the campaign to prevent the building passing into private ownership at a knockdown price in a ‘fire sale’ this month. Artist Maeve McCarthy, who set up the campaign, said that she noticed the building was in disrepair and wants to see the building restored and put to use. The former Hume Street Skin & Cancer Hospital was located at 3-8 Hume Street and the building was acquired by developer Michael Kelly for €30 million in 2006 with the assistance of loans from AIB, say the group. However last month the parties involved moved to sell the building with agents Jones Lang LaSalle seeking offers of over €3million ahead of the sale by tender on May 25. According to Jones Lang LaSalle’s website, the building was built in 1775 by Sir Gustavus Hume, and comprises four storey buildings with original Georgian stuccoed and brick facades. 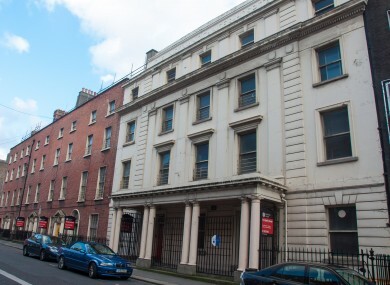 The Save Hume Street Campaign – which the organisers say is backed by An Taisce, the Dublin Civic Trust, Irish Heritage Trust, the RHA, the Georgian Society, local Councillors and TDs – is demanding State intervention to allow a public debate about the future of Hume Street before it is sold for potential commercial use at a fraction of its true value. The campaign wants the 18th century building acquired for cultural/public amenity purposes and restored. As the State – and by extension us the citizens – are the majority shareholders in AIB, should the public not have some say in the future of such a culturally strategic piece of real estate? We believe it will be a tragedy if this priceless building is allowed to pass into private ownership at a knockdown price. Hume Street, with its location off St Stephen’s Green, could become part of the cluster of cultural and public buildings in this part of the city that already includes the National Gallery, National Museum, National Library and RHA Gallery. The group has put together a plan for a cultural centre at Hume Street, which would connect “with the Irish diaspora and focuses on Irish contemporary culture and historical traditions”. The proposal says it would have a Diaspora reconnection centre and museum; centre for commemoration of philanthropists; 18th century ‘time capsule’ and 1798 tea rooms; artists’ residencies, exhibition and performance space; and a broadcast and film initiative. The former Hume Street Hospital is an important building as far as the city’s cultural quarter is concerned. It would be fantastic to see it restored to a use that would benefit the city. A public awareness meeting will take place on Friday May 11, with the venue yet to be confirmed. Email “Call for public meeting on future of iconic Hume Street building”. Feedback on “Call for public meeting on future of iconic Hume Street building”.